November 11 2010 was the day it all went down. I had taken about a week off school to unwind and hunt an 80 acre hill side just 10 mins from my family home. 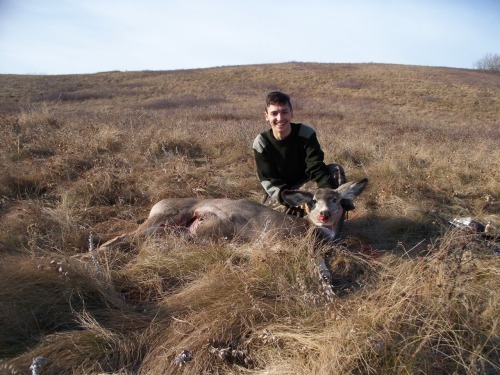 Its a tuff piece to hunt so there is no one else willing to put in the time and effort into using the land. For the last 4 or 5 seasons I have spent many unsuccessful day sitting in one of the three ground blinds that I made. Most years I don't see much but this year everything went just right. The deer were there, the elk were there, everyday coming and going from the stand. I was seeing at least half a dozen critters. On 3 occasions I had the opportunity to shoot at some pretty big bucks, but all three times they were just out of range or he jumped the string. On the morning of November the 11 all my bad luck was about to change. I was in my stand long before sun up, with the amount of buck patrolling the area I didn't want to miss another one. I found that on this land and during the rut the key is to use a decoy. It calms the other wise spooky deer when they are out in the open. That is exactly what happened. The doe came in after being spooked and was instantly calmed moving right under my stand the shot was 20 odd yards. Unfortunately, I have almost no experience shooting from an elevation. which is why I missed the big buck that came under me the day before. 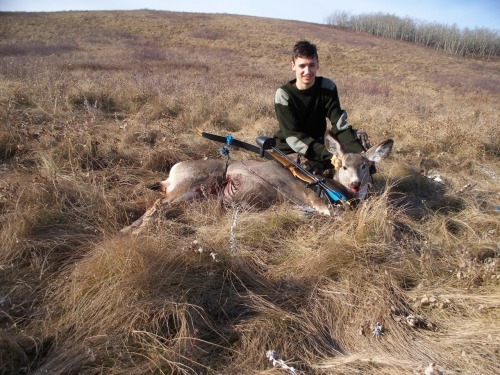 The arrow entered the doe in front of the back leg and buried it self in the liver. The deer went a few hundred yards and laid down. I waited an hour and then tracked the big mule deer doe. She was bed down in a little dip in the field. I snuck up with in 25 yards and put the second arrow right in her heart she went 10 yards and dropped. My first deer MY first kill. I would really like to thank all you guys at this site for all the help and advice. I hope this doe is the first of many. You will always remember your first, Congrats! Congrats on a fine doe,way to follow up. Way to break the ice. Congrats!!! This is a memory that will stay with you forever! Congrats! A'int nothing like your first! That is one big doe! Congratulations... I love eating Mule Deer better then Whitetails...enjot it! Congrats man. Good work. You WILL remember this one. Great stuff brother! Congrats! Time to buy a photo album that allows you to record some field notes in the margins. Start filling up some pages! Im hunting in Alberta just about half hour outside of calgary. Outstanding job and a great finish for your first.